Because datasets and digital object collections can be large and heterogeneous, one dataset or collection of digital objects may be broken into multiple AIPs. In such cases, the multiple AIPs can be intellectually combined into one AIC, or Archival Information Collection, defined by the OAIS reference model as “[a]n Archival Information Package whose Content Information is an aggregation of other Archival Information Packages.” (OAIS 1-9). a METS file containing a fileSec and a logical structMap listing all the related AIPs. In storage, a pointer.xml file gives storage and compression information for each AIC METS file and each AIP. This part of the user guide is for creating and updating AICs. Ingest a standard transfer consisting of metadata and data files, or create a SIP from backlog using the SIP arrange pane. The AIC can be represented by any combination of letters and numbers. At bottom of screen, click the Create button. Return to the ingest tab, finish processing and place the AIP in archival storage. Repeat steps 1 through 6 to create as many AIPs as desired. In step 1.4, be sure to enter the same value in Part of AIC if all of the AIPs are destined to be added to the same AIC. 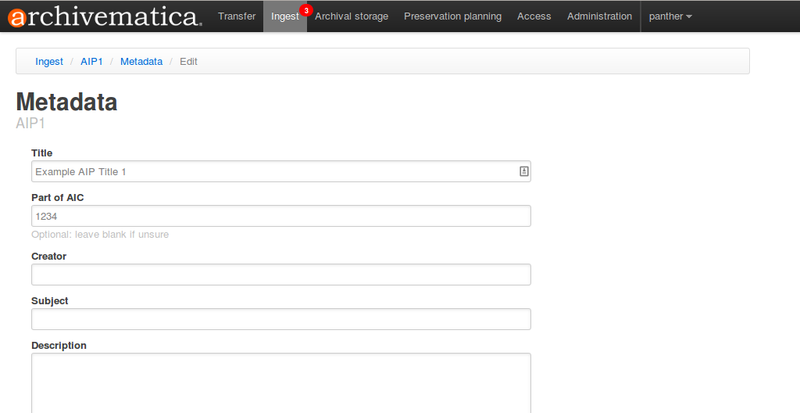 Once all the AIPs have been placed in storage, open the archival storage tab. 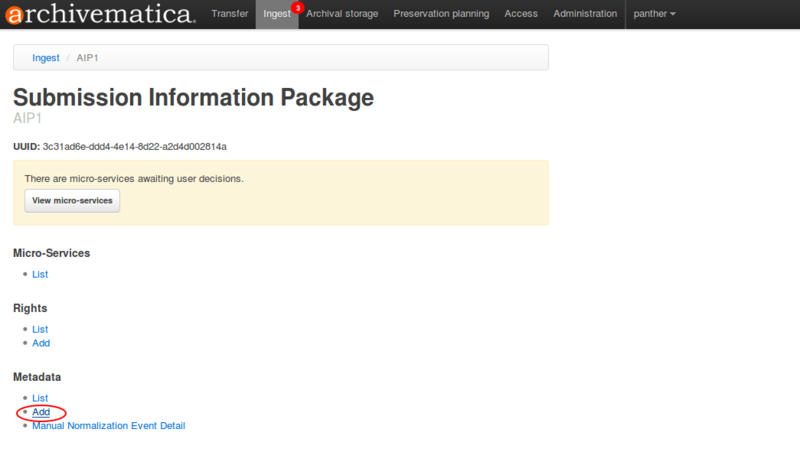 Archivematica will produce a metadata entry template for the AIC. In the template, at a minimum enter values into Title and Identifier fields. The Identifier value must be structured as AIC#[number]. Continue processing the AIC and place it in archival storage. Open the Archival storage tab. To view a list of an AIC and its constituent AIPs, search for the AIPs as described in Create AIC, above. Click Add new to add a second search query using the OR boolean operator. In the second query line, enter AIC#[number] in the search box and select AIC Identifier as the search field. Click the Search archival storage button. In the results list, the AIC is distinguishable by the entry in the AIC # column, as shown in the screenshot (the constituent AIPs are shown with Part of AIC#[number]) in that field. The Files column lists the number of AIPs in the AIC. This should match the number of AIPs shown in the search results. A bug is preventing the correct AIC file count in version 1.2 (see Bug #7155 . If you would like to add more AIPs to an existing AIC, the original AIC should be deleted via the archival storage tab. An AIC is deleted in the same way an AIP is deleted: see Delete an AIP. Add as many new AIPs as desired as shown Creating AIPs above, and create a new AIC as shown in Creating AICs.